In an increasingly globalized world, the importance of travel cannot be overstated. But with more than 1,2 billion international arrivals in 2017, traditional security systems are under pressure. How can we ensure safe travel in the future while improving travel experiences? We are on the brink of a politically, economically and socially fractured world. That’s why the World Economic Forum’s Annual Meeting 2018 theme was aimed at developing a shared narrative to improve the state of the world. Being a WEF Strategic Partner for 19 years, Accenture brings leadership for digital transformation, redefining strategy, sustainability, and technology. The travel system as we know it is under pressure from the growing number of travelers, infrastructure capacity limits and ever-increasing security requirements. 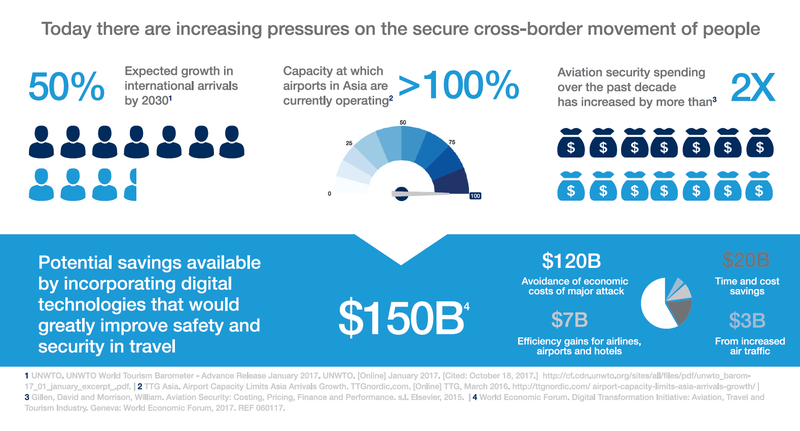 The Known Traveller Digital Identity report, co-published by the WEF and Accenture, highlights the opportunities made possible through emerging technologies like biometrics, cryptography and distributed ledgers to accelerate security capabilities. Modern travel is a marvel, quite frankly. It has put every corner of the Earth within our reach, giving us the ability to cross vast distances with relative ease. If you take a step back, boarding a plane and emerging on the other side of the world mere hours later is nothing short of magical. Unfortunately, that magic seems to unravel upon closer inspection. Travel has become a pillar of the global economy. It has made our world smaller, more accessible. But it has also generated challenges, both in terms of security and comfort. The ever-increasing, ever-deepening need to keep borders, nations and travelers safe is severely straining our existing systems. New regulations designed to counter potential threats and guarantee safe passage emerge every year, each requiring more manpower and effort to implement. This puts enormous pressure on a system of passports, visas, security checks, customs and immigration control that has not seen significant foundational and conceptual improvement in decades. The result? A litany of time-consuming screening procedures and subpar traveler journeys. Already, many airports have hit the limits of their physical footprint. Security staff is overburdened, while travelers languish in long lines at checkpoints and passport control. With a 50 percent increase in international arrivals as a conservative projection for 2030, that burden will only grow heavier. The lines will only get longer. What this illustrates is that our current security paradigms have taken us as far as they can. If we are to prepare ourselves for the future of security in travel, we need new approaches that embrace modern technology to create better outcomes, both in terms of safety and amazing user experiences. What if travelers could be the stewards of their own identities? What if they could decide when and where they shared which information with whom? What if they could opt into a system that allowed them to prove their identities faster, earlier and with far greater certainty than is possible with current means, building their known traveler status in the process? This is the vision behind the Known Traveler Digital Identity (KTDI) concept: a decentralized, interoperable and highly secure platform that leverages 21st-century innovations to revolutionize the end-to-end traveler journey, enabling a more secure and seamless experience for the majority. Using distributed technology like blockchain and next-gen biometrics for identification and verification, it gives users full control over their identity and travel data, allowing them to share specific aspects of their personal profiles with government agencies and the private sector quickly and securely. In doing so, it would embody the 4 Ps of self-sovereignty, creating a framework for digital identities that are private, personal, persistent and portable. Unlike the security measures we see today, from traditional wait-in-line checkpoints to travel safety profiles like Privium and Global Entry, the Known Traveler Digital Identity prototype is not tied to a particular use case, physical location or siloed service. Ownership rests with the travelers themselves, who not only decide which aspects of their identities they are willing to share, but when they wish to do so and in which situations. Instead of focusing on bilateral agreements between countries, the Known Traveler Digital Identity concept is a paradigm shift that emphasizes traveler self-sovereignty. It positions travelers as linking pins, putting them in control of their digital identities. Instead of simply serving the 1 percent of frequent travelers, as we currently see with solutions like Global Entry, the KTDI concept focuses on the 99 percent majority, making seamless and secure travel available to all. Robust, efficient and human-centric, the concept provides users with greater freedom of movement while simultaneously improving travel security. Like a digital passport you never have to take out of your pocket, a boarding pass you never have to show or a security checkpoint you never have to wait in line for, it will make security touchpoints less intrusive without limiting their ability to function. On the contrary: it will allow the global travel industry to create swift, safe, seamless experiences for all parties involved. The Known Traveler Digital Identity concept was initiated by the World Economic Forum as part of their Mobility system. As their lead strategic partner, Accenture collaborated on the research and helped create the prototype that was revealed at the 2018 Annual Meeting in Davos. Here, we demonstrated the KTDI prototype with full enrollment and identity verification on both sides of the border, from boarding the airplane to entering your hotel upon arrival. For governments, the KTDI concept offers clear opportunities to establish more granular security profiles and improve throughput speeds. Traditional security protocols are time-intensive and heavily reliant on manpower. Agents verify passports and check travelers against watch lists, but this only provides insight into a small part of their identities. An involved process, which nonetheless results in an incomplete picture. Using the Known Traveler Digital Identity platform, travelers can provide security agencies with any data they need to assess them beforehand, from past security clearances to academic certifications and biometric profiles – much in the way they are currently used in visa application processes. Armed with this information, those agencies can then make truly individual security assessments, pre-clearing travelers through customs and reducing the strain on border checkpoints. What’s more, each interaction is stored in an individual’s profile, building trust for future interactions. Once the necessary underlying framework of trust has been established, the KTDI could greatly simplify and optimize many aspects of a traveler’s journey. If you’ve already been cleared for entry into the Netherlands, Switzerland, Canada and the United States, countries like Brazil could potentially decide to waive your visa requirements based on those previous attestations, reducing security overhead while improving your travel experience. Alternatively, travelers could choose to follow traditional security procedures if they do not feel comfortable sharing the information required for pre-clearance. This level of security self-determination simply doesn’t exist today. Where current paradigms offer little to no choice, the Known Traveler Digital Identity concept offers two: how much information you want to share, and whether you wish to share anything at all. The advantages of this new system are not limited to government applications. The Known Traveler Digital Identity concept is interoperable by design, allowing a far greater number of use cases than possible with current travel safety profiles. This provides interesting opportunities for the private sector, especially for those industries whose activities are already intertwined with travel. In most countries, for instance, hotels are required by law to verify and register the identities of all travelers who stay in their establishment. For guests, this means checking in at the front desk, presenting their passport or identity card and waiting until the documents have been processed before they finally receive their key. This can be an unpleasant experience for weary travelers who simply want to get to their rooms, and one that runs counter to the industry’s focus on hospitality. At present time, however, there are no other practical alternatives for hotels to meet their legal obligations. Using the Known Traveler Digital Identity concept, travelers could forego these interactions altogether. By presenting themselves for a biometric scan in the lobby and undergoing a simple check to verify their digital identity, they could retrieve their mobile key in an instant and proceed to their rooms, possibly even opening the room itself with their fingerprints, all without human interaction. Applications and use cases like these go beyond convenience. By creating universal utility and offering a potential for positive interactions along various customer journeys, they also build acceptance, trust and public support. These will be the vital ingredients in the platform’s success. When users recognize that their privacy is guaranteed, that they themselves hold the keys to travel safety and more seamless user experiences, they will be far more likely to embrace the platform and its advantages. The Known Traveler Digital Identity concept represents a unique opportunity to revolutionize security in travel on a global scale, for all parties involved. In the coming period, the WEF, Accenture and the working group partners will begin laying the groundwork necessary to make this vision a reality, identifying partnerships, solving challenges and outlining next steps. Many have already publicly shown interest. Canada has announced it will be a partner in the pilot program. Marriott International has also shown enthusiasm, vowing to collaborate in the development of the concept. Hilton has voiced its support, as has the government of the Netherlands. An auspicious beginning to an exciting journey into the future of travel. Of course, challenges still remain. Many of the technologies involved are still under development. The way forward is very much one of experimentation, of minimizing risks and maximizing opportunities, of conceptualizing new use cases and testing them in the field. We must work hard to build confidence, to demonstrate that the Known Traveler Digital Identity platform is reliable, secure and trustworthy. But the reasons to do so are as clear as they are urgent. We must prepare for a safer, more user-friendly future in travel. And this is how we’re going to get there.